After 525 years, faith must always be "announced with courage and lived with love"
Mgr. Peña Rodríguez denounces corruption in the judiciary: "Justice must go back and follow the right path"
Santo Domingo (Agenzia Fides) - On the day of the Feast of Our Lady of Perpetual Help, June 27, the agreement that allows the Adoratrices, the Sisters of the Sacred Heart and the Oblates of the Most Holy Redeemer to work together on the "Casa Malala" project in the Dominican Republic was signed. A project that underlines the importance of cooperation among religious congregations to manage this reception home for victims of trafficking. "In 2016 we met together with the other institutes with the Prosecutor to talk about human trafficking, and our proposal was to allow us to manage this home" explains Nieves de la Cruz, an Oblate working in the Dominican Republic. "It was a house initially managed by the State, but we had the feeling that the attention and reception required for this type of project were lacking", she underlined in a note sent to Fides. The authorities began appreciating the initiative and asked the religious of this intercongregational network to develop a project of attention towards the victims. "It continues to maintain the name of Casa Malala due to the significance of Malala Yousafzai's struggle for the education of girls in her country", explains Nieves. The project was born to respond to the lack of a place in the Dominican Republic where victims of human trafficking can be accepted in a residential (family) form and, above all, to address the problem of the high number of Venezuelan women who have entered the country as victims of trafficking for sexual exploitation. "We had to respond to this human drama", says Nieves. "We have many emigrations of Venezuelan women in the country, many of them victims of trafficking" she explains. There are many causes that lead to this situation: poverty, situations of violence and other factors in the country of origin that push them out of the country and often fall into the networks of traffickers. "Many of them are professionals, prepared, mothers ... But they all have despair in their eyes and the desire for economic stability so they can send money to their family, even if they are currently in an irregular situation in the Republic Dominican", continues Nieves. "Not all of them are adult women, since over the years, cases of all ages, including girls and adolescents, have increased". The Dominican Republic is not however the final destination, sometimes they just pass through. "Many women are sent by the big mafias to other countries, like Panama, Ecuador, Colombia, Chile and even Spain and Lebanon" explains Nieves. As part of the network that fights human trafficking, the Oblates and the Adoratrici have been working together for a long time, especially when women had to be cured and needed a residence. "We realized that this great work could not only be done by the anti-trafficking network, but we had to involve all the religious life in the project", says Nieves. 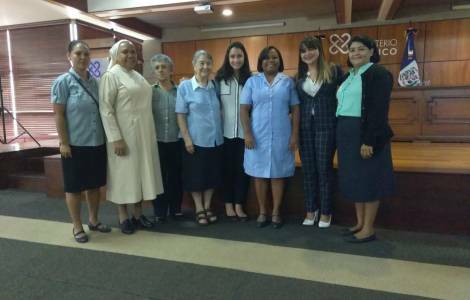 In this way, several congregations were invited to become aware of the reality of trafficking in the Dominican Republic, and from this the Sisters of the Sacred Heart gave their availability. There are also lay people who actively participate: "three lay people work with us, and at present a lay person is the coordinator, and she will work at Casa Malala as a psychologist", concludes Nieves.